We hope you were able to make it to SGIA 2017 in New Orleans. If not, we'll recap the show and give you a brief preview of M&R equipment tentatively scheduled for the Long Beach Show on 18-21 January 2018. 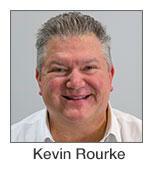 This marked the first year Novus Imaging debuted equipment as one of the M&R Companies. 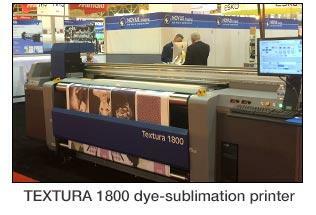 Novus showed three large digital graphics printers in a separate booth: the Ultra® flatbed printer, the new Ultra® 3200 roll-to-roll printer, and the new Textura™ 1800 dye-sublimation printer. All three drew strong interest. M&R had the largest booth at this year's show, filling the 8000 square-foot space to the brim with the best equipment the industry has to offer. 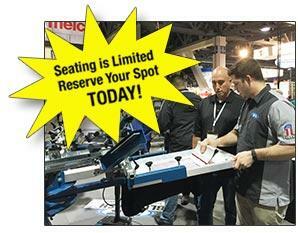 M&R's Digital Squeegee® Hybrid Systems drew large crowds. M&R paired the Stryker oval press with the DS-4000 digital printer and paired the VictoryOne oval press with the DS-2000 digital printer. M&R's hybrid printing systems combine the best attributes of screen printing with the best of digital printing. 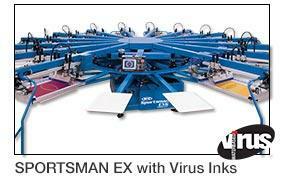 Sportsman EX prints were made with Quaglia's new wet-on-wet Virus Inks. Both the press and the inks performed flawlessly. Particular interest was directed toward M&R's new Sprint® 3000 DHZ conveyor dryer, which features the Crossover Belt and dual heat zones. Not only can it function flawlessly as a full-width split-belt 183 cm (72") single-chamber gas dryer, it can be converted on the fly into twin 91 cm (36") heat chambers. The heat chambers can be set at different temperatures and the belts can be run in the same or opposite directions. M&R's new Photon UV LED cure system for graphic screen printing drew lots of interest. Photon's UV LED lamps run cool, consume less power, last longer (up to 25,000 hours), and increase conveyor belt longevity. Photon's sheet sensor automatically turns LEDs on and off to further reduce power consumption. 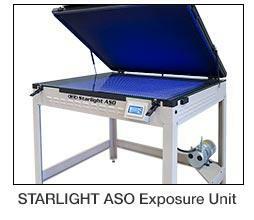 The new Starlight ASO™ Exposure units received lots of attention for its Adjustable Spectrum Output that allows it to perfectly cure almost any emulsion type quickly and efficiently. The HotHead™ Fabric Compression System continued to heat things up on-press with a couple additions to the line; the HotHead™ Teflon Screen simplifies on-press heat treatment, and a new HotHead™-based HQ-1 foil application system installs entirely within the printhead area and allows for quick repositioning when changing jobs. In short, it was great to be back in the Big Easy—and to be back with so much popular and groundbreaking new equipment. But if you missed SGIA, don't despair. Most of the equipment that appeared at SGIA—including the new Textura™ 1800 dye-sublimation printer, the Sprint 3000 DHZ dryer, the Starlight ASO, and the modular Eco-Tex—will return for Long Beach 2018. And M&R is already finalizing innovative new products for the show. For more information about these or other M&R products, contact your M&R regional sales manager. 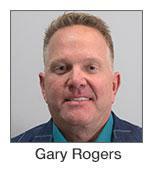 M&R's Novus Imaging Division has named Gary Rogers Regional Sales Manager for Digital Graphics (West) and named Kevin Rourke Regional Sales Manager for Digital Graphics (East). Mike Mills, president of M&R's Novus Imaging Division, said, "We are extremely fortunate to be able to add Gary and Kevin to our sales force. 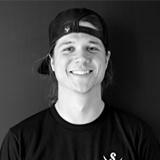 Both have extensive backgrounds in digital imaging systems and a wealth of experience in digital imaging sales. As Novus Imaging continues to expand its offerings, Gary and Kevin will play a crucial role in bringing that awareness to the industry." Are welding and epoxy the best way to permanently join pieces of metal? Not always. Welding is obviously superior to rivets, and epoxy bonding is even better in certain scenarios. However, there are some situations where both methods are surpassed by liquid nitrogen. 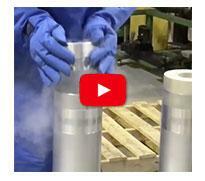 Liquid nitrogen (LN2) is extremely cold (as you can tell by the safety gear worn in the video). Under normal atmospheric pressure, LN2 maintains a liquid state between -238°C and 196°C (-346°F and -320.44°F). In fact, liquid nitrogen is so cold it can shrink metal. Not by much—but just enough. M&R used to attach aluminum dryer roller hubs to aluminum rollers using epoxy. These days, however, M&R machines the aluminum hubs a few thousandths of an inch greater in diameter than the openings in the aluminum rollers they're designed to fit into. Then M&R technicians put those aluminum hubs into a bath of LN2 until the diameter shrinks enough to allow the hubs to fit inside the rollers. As soon as the diameter of the hub is [temporarily] less than that of the roller, the technician drops in the hub (see a short video of the process here). As soon as the hub warms up, the two pieces form a bond so tight that there's virtually no way they'll ever come apart without destroying one or both parts. The advantages of liquid nitrogen aren't limited to simplifying the fitting process. The use of LN2 is exponentially faster than the epoxy method, which required hub gluing, hole drilling, pin mounting, and finish machining. It used to take approximately eight hours to process eleven hubs and cylinders using epoxy. But nitrogen shrink-fitting the same number of pieces takes an amazingly short 52 minutes. And nitrogen shrink-fitting is a clean, safe, and green technology. That's the way to make a dryer belt cylinder. If your customers are interested in the most comprehensive two-day screen printing course available, tell them to make reservations now. "Our first class quickly sold out," said Andrea Bardenheuer, M&R's director of Latin America Sales, "and the overwhelmingly positive comments coming out of that course led the second course to sell out even more rapidly. Although the February 2018 class is still more than ten weeks out, be aware that many people wound up disappointed because they waited too long to enroll in our previous classes." The course fee is $299.00. Lunch will be provided both days. For further information—or to reserve a seat—please email Andrea Bardenheuer at andrea.barden@mrprint.com. At M&R, preparations are already underway for ISS Long Beach 2018 in Long Beach, California. Long Beach is the largest show on the West Coast and the second largest show in the United States. Details are still being worked at press time, but you can count on finding the show's largest display of digital and screen printing in the M&R booths (1501, 1601 & 1801). And not only will most of the products that debuted at SGIA be there, M&R will debut more products now in development. Look for more details and a complete product list in future M&R newsletters or contact your M&R regional sales manager for more information.